I read with great interest Bernie Schoenburg’s column in the local State Journal Register newspaper this week. 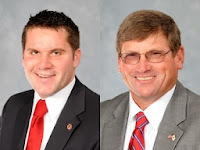 It seems three Illinois House members exercised some quick thinking and helped save a man’s life in nearby Decatur, Illinois. What makes this story extra special is that two of those legislators are UIS alums. Our very own Wayne Rosenthal and Adam Brown, both of whom I’ve had the pleasure to meet and I can tell you I’m not the least bit surprised by their actions. I know UIS alums are in the world every day doing extraordinary things, but it’s not often I get to praise them personally for going above and beyond. Well done, Representatives Rosenthal and Brown! Your alma mater couldn’t be more proud of you.